A recent story from the The Telegraph, one of the UK’s finest and most respected newspapers, prompted this post. The piece, which was published September 22, pointed out that oil giant BP has an opening in its public relations department. As loyal followers of this blog know, I’m seeking that next great position in public relations. The job at BP is for “a new head of global communications, according to the Telegraph. The reason: BP wants “to restore its tarnished reputation after the massive oil spill from its Macondo oil well in the Gulf of Mexico.” You remember that disaster, don’t you? 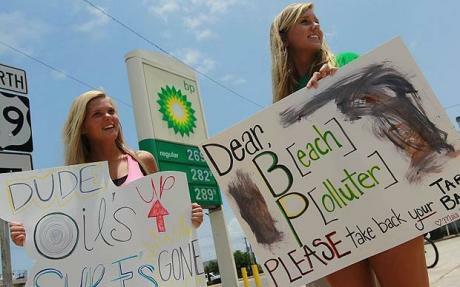 Protestors in the Gulf made their viewpoints known during the months following the massive oil spill at the BP Deepwater Horizon rig. So, I’m officially throwing my proverbial hat into the ring for this tremendous opportunity. To the HR folks at BP, here are my qualifications. 1. Experience: I have 20 years of experience in the public relations arena. Frankly, none of it is in the oil or energy business. But that shouldn’t matter, because the public relations team in place during the Gulf spill apparently didn’t have much experience in the oil business either; otherwise, they would have been better prepared to communicate during the ensuing crisis. 2. Card-Carrying Member: No kidding: I’ve held a BP (before that Amoco) credit card and been a member of their motor club since 1981. That has to count for something, right? 3. No Language Barrier: This job is headquartered in London, where the official language is English. I’ve spoken and written in English all my life. There would be a very sooth transition, however, I’m keeping our home in Chicago, just in case. 4. Familiar With Key Issues: Within days following the tragic, fatal explosion that caused the spill off the Louisiana coast, the PRDude began blogging about the subject — from a public relations perspective, of course — back in May with his first of three posts. 5. I’ve Got Credibility — And I Can Prove It: Future PR textbooks will point out that BP mishandled the Gulf Oil spill crisis in a monumental way. To take one perspective, whoever BP put in front of the media to communicate their story lacked credibility. Well, I have it. In fact, I’m one of 5,000 public relations professionals from around the world who hold the Accreditation in Public Relations (APR) credential, and I serve on the Universal Accreditation Board, which grants and administers the APR. We APRs are bound to practice with high ethical standards, which include transparency, protecting the free flow of communications and avoiding conflicts of interest. We have to be credible! The Accreditation in Public Relations (APR) credential is held by just 5,000 professionals worldwide. The Telegraph piece did not offer much more information on the job search, except that a man named Bob Dudley, who is slated to replace disgraced CEO Tony Hayward, will be involved. Anyone know Mr. Dudley? I visited the BP online career page, but the job is not posted there. But, if Mr. Dudley or anyone in the HR department at BP is interested in learning more about me, they can visit my website. This entry was posted in Uncategorized and tagged Accredited in Public Relations, BP, Edward M. Bury, Gulf of Mexico oil spill, public relations. Bookmark the permalink.